STARTING TODAY: Forget The Regular Dull BBQ Forks - The Expandable Grilling Sticks Are Here To Stay! Planning a Barbeque party is never a bad idea, right? Do you want to make sure that all your guests, from the oldest to the youngest will be blown off with your delicious treats? 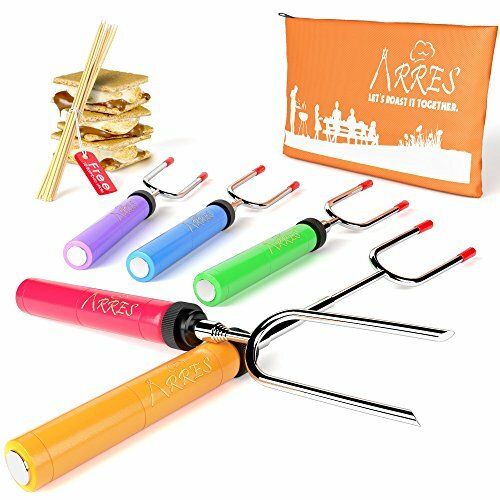 Meet The Amazing Roasting Forks By ARRES- BBQ Has Never Been More Fun! With this smart set of 5 colorful-handled forks, you and your children can have a family activity and create amazing memories together. Thanks to their long design (34'') and safety pins, make sure that your little ones won't get their hands hurt or burn. What's more? The sticks can rotate to ensure that your marshmallows will be evenly roasted, while you don't have to get near the fire to turn them around like the cheap ones. Too Good To Be Just For Marshmallows, Right? Of course, this cooking utensil can be your best friend while grilling . They will work wonders with hot dogs,weiners sausage, chicken wings, vegetables and more. Do You Need More Reasons To Get This Great Grilling Set Today? Along with your order you will also get a super useful orange canvas pouch, where you can keep your forks neatly organized till next time or carry them around with comfort! Whatís more? With the 10 bamboo sticks that you will receive completely for free too, you can start organizing your next BBQ today. With ARRES Lifetime Warranty, What Are You Waiting For? Order This Must-Have BBQ Tool Today! ⛄ WE WANT TO MAKE YOUR KIDS SMILE! The best gifts in the world are not in the material objects one can buy, but in the memories we make with the people WE LOVE. Let us bring Joy and Color in your life. Our vivid colors range from Red, Blue, Orange, Purple and Green. ⛄ ASK OTHERS: See how people feel about using our products. They write things like: "Happy grandkids", "We loved the Recipe Ebook included. ", "Great idea for camping! ", "My kids love these", "Worked perfectly!" And the best part? For easy storage, and travel the forks collapse from 34" to just 10"! ⛄ LIFETIME MANUFACTURER WARRANTY: ARRES's primary goal is to put a smile on your faces. WE ARE OBSESSED ABOUT CUSTOMER SERVICE, so, if for whatever reason, you don't absolutely love your product just return it, and we'll refund every penny (or replace it, if there is a problem). This warranty only applies to items purchased directly from the manufacturer and does not apply to our products purchased through non-authorized resellers. ⛄ SMART DESIGN: We've taken great care in making it Perfect! Extend your stick to 34" and roast your goodies from a distance. Fast and Easily. Even more, every fork comes with safety pins to make the skewers safe for storage and handling around children. ⛄ AMAZING FREE BONUSES: ★"15 Easy Roasting Recipes" E-book★ will be included in our set that comes with a beautiful orange canvas bag for storage and thanks to the portable size you can also take them with you at camping or an outdoor BBQ. What's more? 10 FREE BAMBOO STICKS to serve your delicious marshmallows! Check the pictures and the E-book for more ideas on how to use them. If you have any questions about this product by Arres, contact us by completing and submitting the form below. If you are looking for a specif part number, please include it with your message.